FOOBY App: Get your perfect cooking aid now. 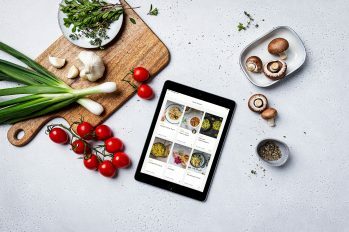 A range of features makes the FOOBY App the perfect shopping and kitchen aid, such as: how-to videos, step-by-step guides, shopping lists, and the option to save all your recipes in one place. With FOOBY, Coop’s new culinary platform, we want to share the wonderful world of cooking, eating, and enjoyment with you. Whether you’re a passionate cook or a complete kitchen novice, here you’ll find tons of great recipes (organised by category), food know-how, cooking instructions, how-to videos, and unlimited inspiration. There are also many exciting stories from people who love good food as much as we do. Incidentally, our name is a combination of “foodie” and “hobby”. Take your time and discover the tantalising world of FOOBY. Quick family meal in the evening or a five-course menu for guests? Soup or salad? Italian or Mexican? Cocktail party or brunch? Kid’s birthday party or Christmas dinner? Cooking or baking? Sweet or salty? Vegetarian or vegan? Swiss or international cuisine? Regardless of what you’re in the mood for, you’ll find loads of great cooking ideas and even more inspiration in our recipe categories and recipe highlights that’ll have you sorted on all those days when you aren’t sure what to make. Because we all have those. No matter if searching according to specific ingredients or seasonal specialities, finding the right recipe idea is quick and easy. In Recipe of the Month, we present the culinary highlights of the coming or past four weeks, from refreshing ice cream in August to a festive and hearty roast in December. FOOBY Cookery School is for anyone who’s not a gifted top chef who has mastered the art of sautéing or knows how caramelising works. Here’s where you can practice perfecting your knife technique, learn about the most important ingredients for cooking, and can browse our how-to videos for practical and helpful instructions. Just like with real life, in the FOOBY Cookery School, you never stop learning new things. In FOOBY How-tos, we’ll show you step by step how to best peel an artichoke, how to make a beef tenderloin that’s juicy and tender, and how to make delicious homemade caramel… plus much more. So whether you’re cooking together with friends or in your mother’s kitchen, here’s your chance to shine! From almond milk to maple syrup and sugar to zucchini, the FOOBY Food lexicon is filled with exciting background stories about the most important thing about food – the ingredients. We give you information about the origin, relationship, or effects of the most important foods. Because as passionate foodies we want to know everything about the fine things we cook with. And FOOBY Cooking Know-How simply and vividly explains many different cooking techniques and kitchen concepts. Here’s where you’ll find answers to all your questions about cooking. Be it pickling, dehydrating, breading, or stewing: with FOOBY Cooking Know-How you’ll cook like a pro! Of course, FOOBY isn’t only interested in cooking at home, but everywhere where there is good food to be enjoyed. You’ll find tips on dining out at the Foobyverse for those exceptional occasions when your own kitchen isn’t warm. Where are the best restaurants and bars in Switzerland? We’ll share insider tips from the world of Swiss gastronomy. In addition, you’ll also find out about culinary events such as food fairs where FOOBY is represented. And thanks to exciting reports, you’ll dive into international and local culinary worlds, get inspiration for refined table decoration, and interesting insights into the restaurant scene. Looking for a gift idea? Under “Cookbooks” we recommend new releases that not only inspire unique taste creations, but that are beautifully presented with a passion for detail. In addition, you’ll find useful FOOBY recipe cards in the store for quick and easy dishes, small shelf tags with interesting food facts, and the quarterly FOOBY print-edition magazine. Not enough inspiration? Then follow us on Facebook, Pinterest, or Instagram. Or subscribe to our newsletter – never miss another news item, article or recipe. But that’s not enough. On the FOOBY website you’ll also find exciting stories about FOOBYS – the people and brands behind FOOBY. Because rummaging for recipes, searching for the best ingredients, and cooking itself may be a lot of fun, but it is also a lot of work! And that's why our FOOBYS are here for you: they spot new food trends, visit food producers in Switzerland and around the world, and always inspire us with new stories. Have fun exploring and experimenting – have fun with FOOBY!